The University has been lauded for maintaining high level of implementation of its research funds. Giving the commendation was the Coordinator of both the Economic Community of West African States (ECOWAS) Regional Agency for Agriculture and Food (RAAF) and the Support Programme for Food and Nutrition Security in West Africa (PASANAO), Mr. Amadou Konate, during the FUNAAB-RAAF-PASANAO project assessment and evaluation visit to the University, where he revealed that FUNAAB had benefitted from the One Hundred and Eighteen Thousand, Nine Hundred and Fifty-six Euros (€118,956) project, funded by ECOWAS’ RAAF and PASANAO with the support of the French Development Agency (AFD), which was meant to last for one year. Mr. Konate stated further that the programme was aimed at supporting Food Security and Nutrition in West Africa, and it is an organ of ECOWAS based in Lome, Togo. He said RAAF was mandated to support the project of ECOWAS through PASANAO, by calling for proposal for a pilot project that is focused on different topics such as Youth Empowerment in Rural Areas, Credit Insurance, Storage and Smart Agriculture. He noted that FUNAAB was the first Nigerian university to benefit from the funding and that presently, 24 projects were spread across different West African countries such as Burkina Faso, Niger, Togo, Benin Republic, Liberia, Nigeria and Senegal. The FUNAAB Project Coordinator, Professor Adebayo Shittu of the Department of Agricultural Economics and Farm Management, College of Agricultural Management and Rural Development (COLAMRUD), who is also supervising the project being carried out in partnership with the National Cereals Research Institute (NCRI), Badegi, Niger State, stated that the essence of the team’s visit was to evaluate the progress made so far on the project. Professor Shittu said the project had been running so smoothly with challenges that were surmountable. The Professor of Agricultural and Resource Economics, thanked the University Management and the Directorate of Grants Management (DGM) of FUNAAB, for the speedy approval of funds whenever request was made. “With six PhD and four Master’s students getting direct data, to help carry out their research, the project has also been helping the University to carry out its core mandate of teaching, research and extension”, adding that so far, four conference papers had been submitted from the preliminary results gathered, while it had been a ‘win-win’ partnership between FUNAAB and NCRI, which have five members on the project in which one of them was a PhD student. 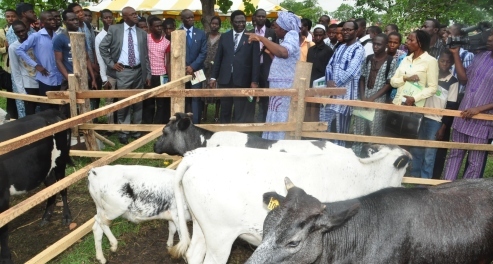 He said the farmers were the final beneficiaries of the research findings as they (the farmers), through interaction, engagement and education by the research team, were getting to know the causes of climate change, as against their initial, erroneous and superstitious belief that witches and wizards were responsible for climate change.